So many kids have food allergies, and as a parent it can make it difficult to find recipes that suite the needs of your family. Even if a recipe looks amazing and fits most of your child’s dietary needs, there is something that may need to be substituted in order for your child to be able to eat it. 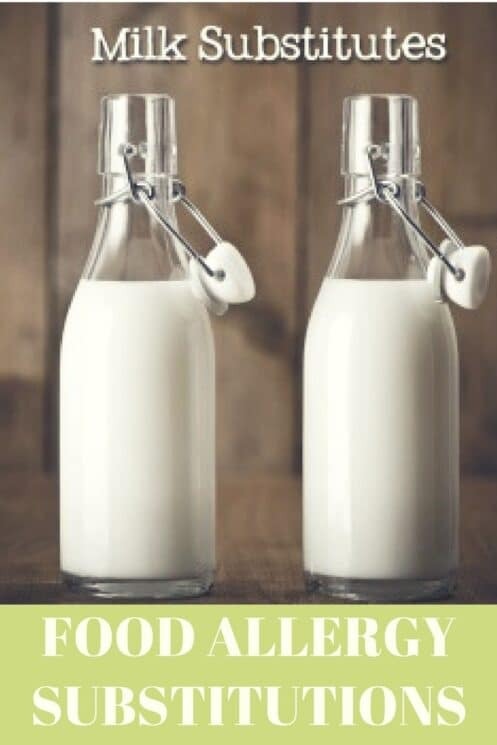 We put together a guide that covers the most common allergies that parents talk to us about – Nut Allergy, Dairy Allergy, Egg Allergy and Wheat/Gluten Allergy. 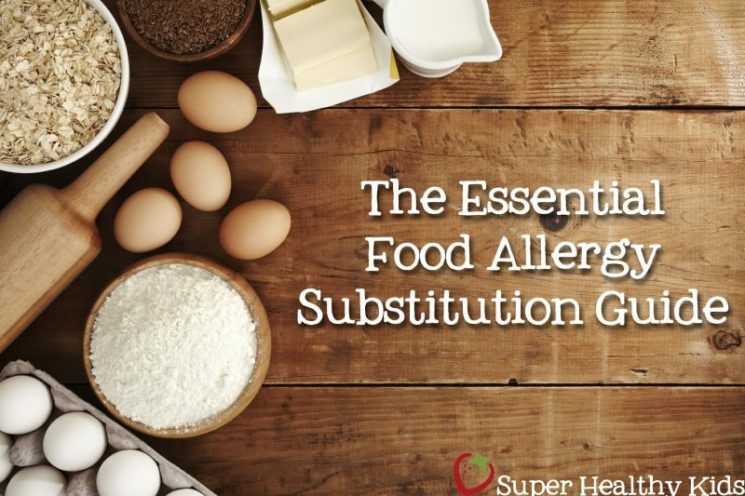 This Essential Food Allergy Substitution Guide should help you to be able to make almost any recipe and substitute the ingredients you need to avoid. 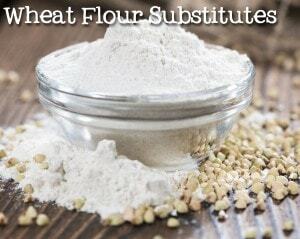 There are a lot of different suggested ways to substitute different flours for wheat flour in recipes. Certain flours work better than others in different recipes, and so some experimenting might be necessary to get it just right for your family. In general, you will get better results if you use a combination of more than one flour to substitute for wheat flour. Gluten free flours fall into 3 basic categories: Light, Medium, and Heavy. Light Flours: sweet rice flour, white rice flour, tapioca starch, cornstarch, potato starch and arrowroot starch. 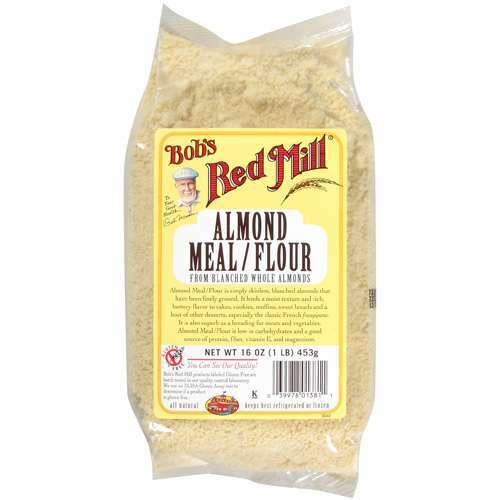 Medium Flours (all-purpose): sorghum flour, certified gluten-free oat flour, and fine rice and brown rice flour. A combination of light and medium/heavy flours tends to produce the best tasting and best texture in your recipe. For optimal results,it is best for muffin, cake, or brownie gluten-free baking mix to have different flours from the pizza or bread recipes! Sorghum Flour High protein flour, the taste resembles whole wheat flour. Some people describe the taste as nutty, others describe it as bland or tasteless. Adds a great texture to baked goods. 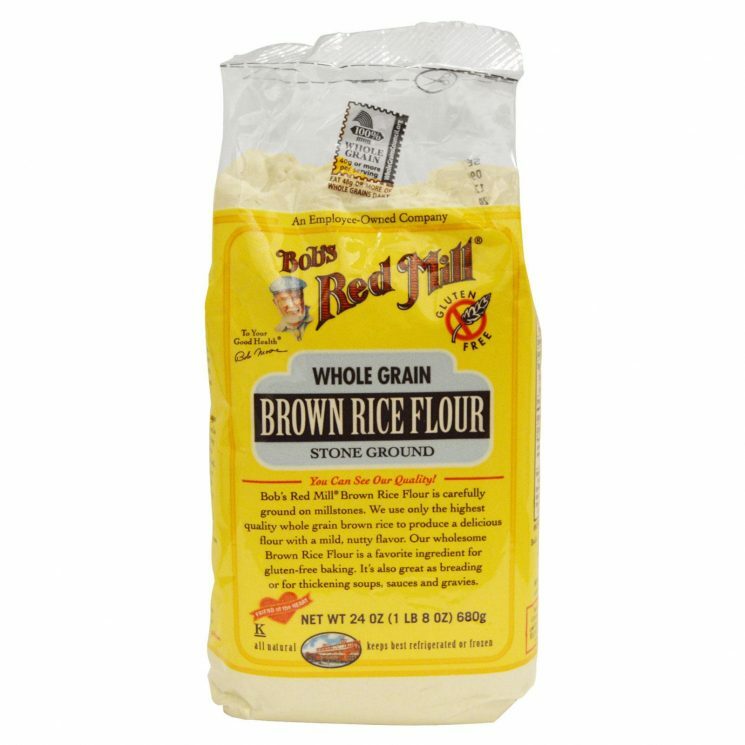 Brown/White Rice Flour Brown rice flour has a slightly more robust flavor than white rice flour, and when used in baked goods, such as cakes and cookies, brown rice flour provides a grainy texture with a fine, dry crumb. Brown rice flour works well in bread recipes. Brown rice flour is whole grain and is more nutritious. White rice flour can be used as a thickening agent for sauces and puddings as well as for making Asian noodles. 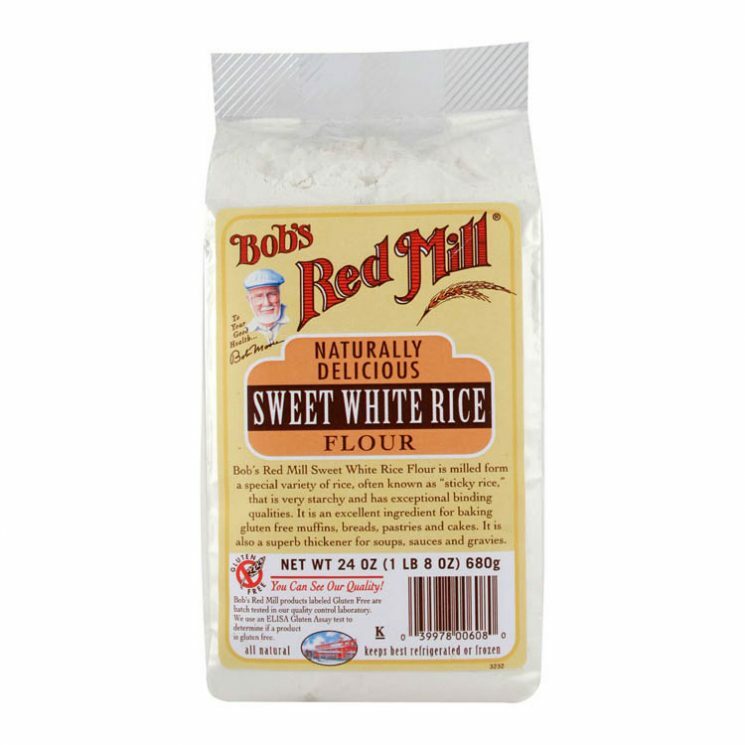 It can be used in some baked goods, such as cakes, cookies, and dumplings, although it can be gritty in large quantities, so it’s best used in combination with other flours. Sweet Rice Flour Preferred flour for making a roux and is often used to thicken sauces and food mixes, providing a strong bonding that can withstand refrigerator and freezer temperatures without separating. It is often used for breading foods prior to frying and for making traditional foods that require flour, such as desserts and baked goods, or rice dumplings referred to as Japanese mochi. Sweet rice flour can also be used as a 1:1 replacement for cake flour. 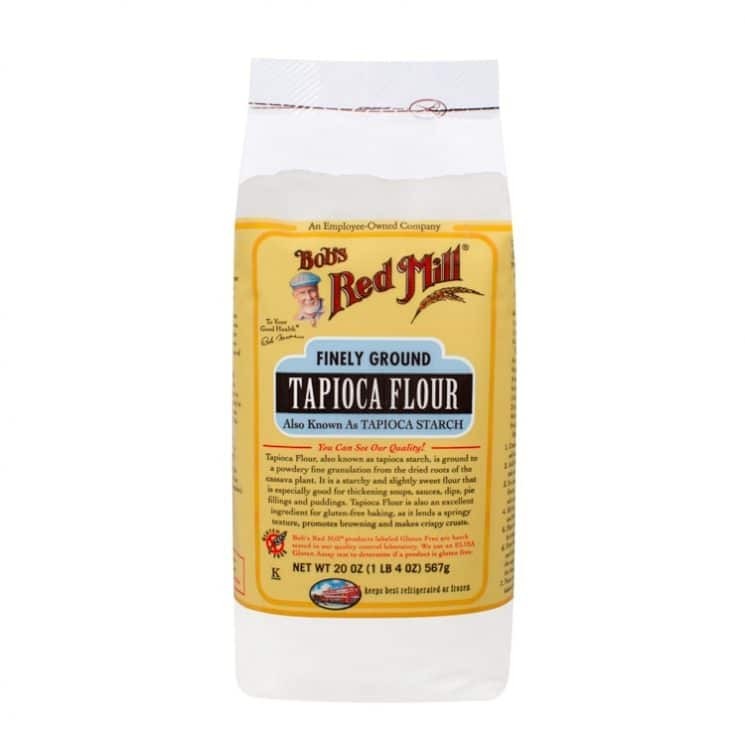 Tapioca Flour A great binder in baked goods when used in combination with other flours. It is also a great thickener for sauces. It will thicken at a low temperature. 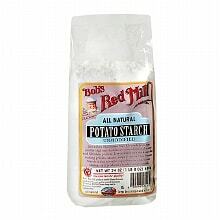 Potato Starch Used as a thickener and can tolerate higher temperatures than cornstarch. It adds moisture to baked goods. A lot of flourless chocolate cakes recipes contain potato starch. 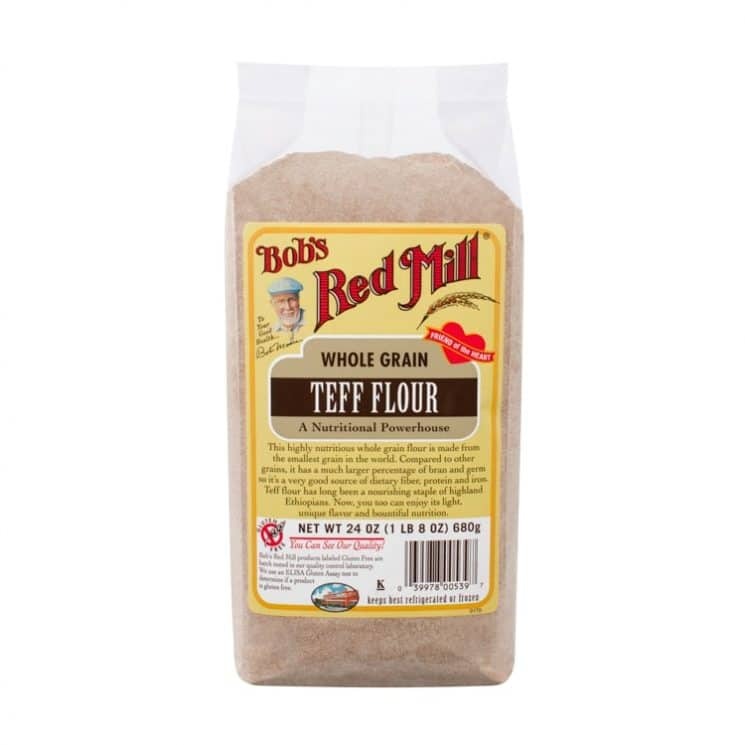 Teff Flour Has a nutty, sweet flavor. Can be used in any of your gluten free baked goods. Teff flour is usually found in its lighter color, ivory teff, but is also available in a darker brown color. 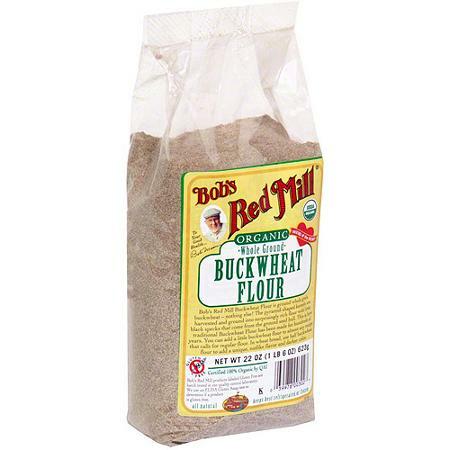 Buckwheat Flour Is not a wheat flour but it tastes similar to wheat. It is not only high in protein, but contains 8 essential amino acids. Using 1 to 1¼ cups in a gluten-free bread is the most you will want to use, with added starches. 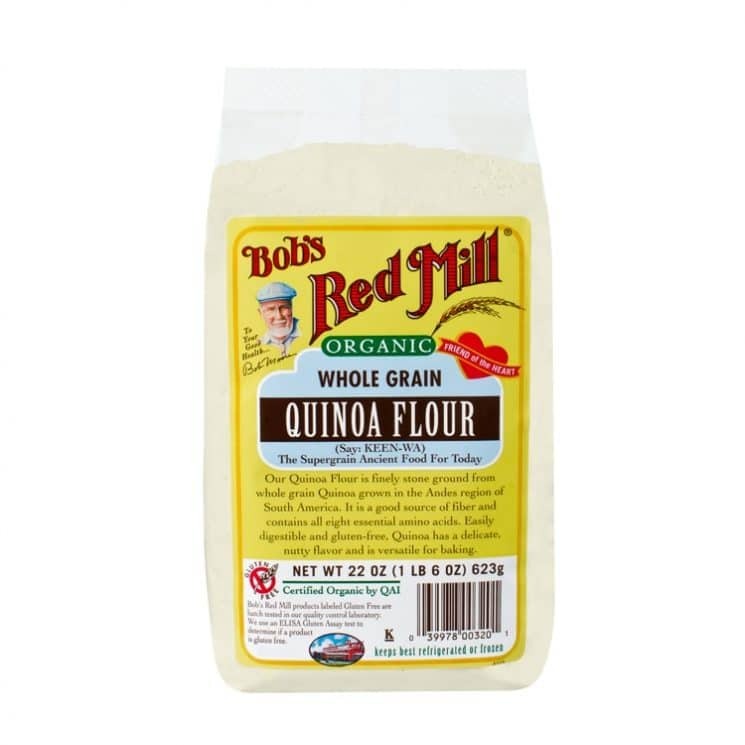 Great for making pancakes and waffles, and also mixed with other flours in muffins and quickbreads. Quinoa Flour Gives baked goods a nuttier taste, which can be bitter. Quinoa flour is chalk full of minerals and B vitamins. Adds moisture to gluten-free baked goods. xc vcxIf you wish to increase the nutritional content of your gluten free baked goods, a little goes a long way, due to its bitterness. Coconut Flour Coconut flour is very absorbent and very little coconut flour is needed in a recipe. In baked goods, you generally want to substitute 1/4 cup to 1/3 cup coconut flour for 1 cup grain-based flour. You will also need to increase the number of eggs. 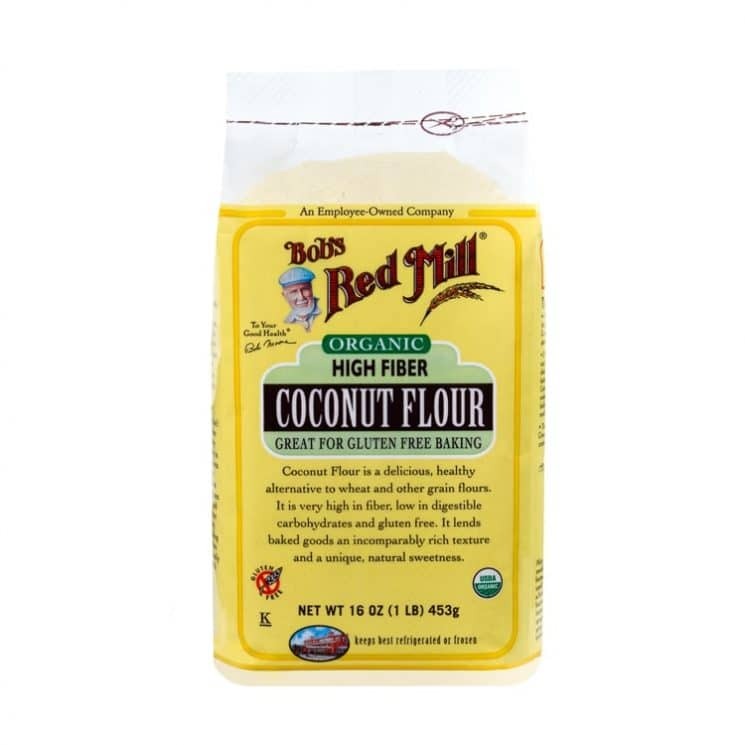 You cannot substitute coconut flour for wheat or other grain-based flours at a 1:1 ratio. They are not equivalent. Baked goods with coconut flour tend to be dry. To reduce dryness, make sure to use plenty of eggs and you can also add cooked, pureed or mashed fruit or vegetables to your baked goods to increase the moisture. Almond Meal The most common nut flour, and is great in small quantities in baked goods. Almond meal is high in protein not only increases the protein levels in your baked goods, but gives it a higher rise and adds moisture. 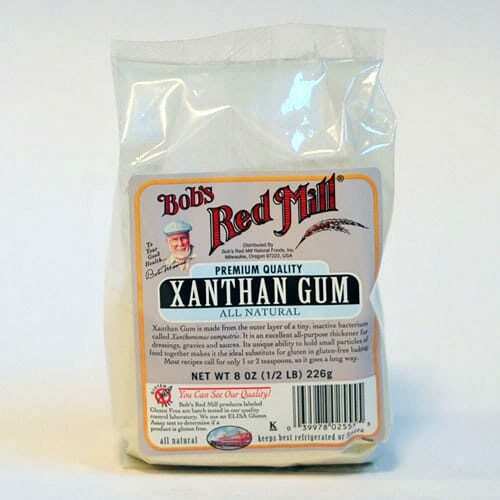 Xanthum Gum Used in gluten-free cooking to bind, thicken and emulsify gluten-free ingredients. 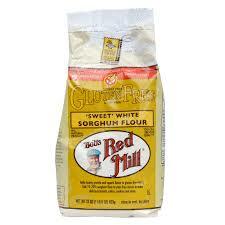 If you don’t add one of these gums to most of your gluten-free baked goods, they will likely end up dry and crumbly. It is expensive, but you only use a tiny amount in a recipe and so it lasts a long time. Evaporated milk is milk that has water content reduced by a little more than half. To make it, simmer your alternative milk in a pan until it reduced by a little more than half. Approximately 3 cups milk will leave 1 cup of evaporated milk left at the end. Be careful not to scald it, using a double boiler works well. 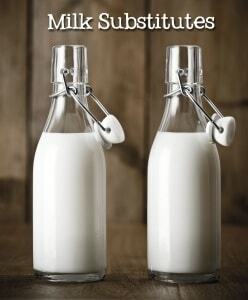 Another alternative for evaporated milk is to substitute coconut milk 1:1 in the recipe. It will add a coconut flavor to the recipe, so it works in some recipes but not all. You can make your own sweetened condensed milk substitute by making evaporated milk (with an alternative milk) and adding sugar. For sweetened condensed milk, mix one cup of evaporated milk with 1-1/4 cups of sugar. Heat until the sugar is completely dissolved. Cool. It will yield 1-1/2 cups of evaporated milk substitute. It will keep in the refrigerator for several days. 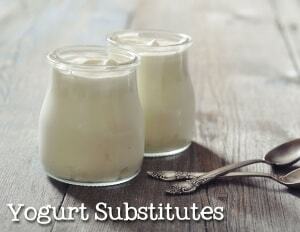 You can use Silk or Mocha Mix brand soy creamers or light coconut milk as substitutes for light cream. 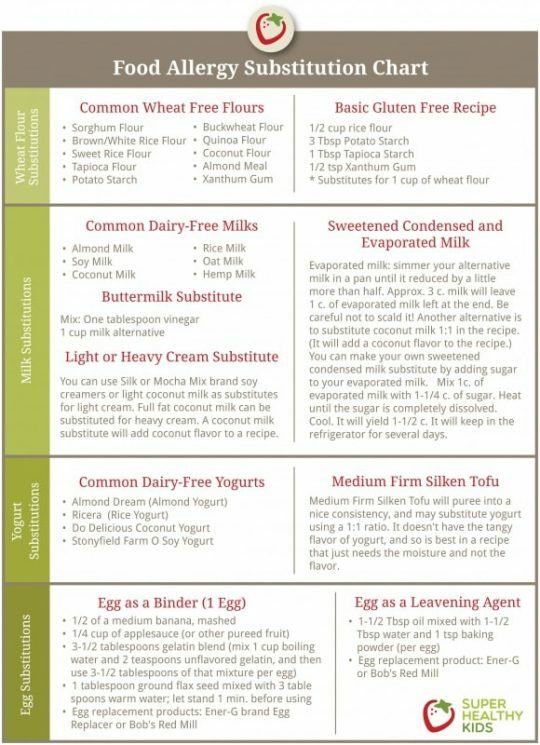 Full fat coconut milk can be substituted for heavy cream. A coconut milk substitute will add coconut flavor to a recipe. In most recipes for baked goods, eggs are used as a binder (to hold the recipe together) or leavening agent (to help it rise). Sometimes eggs play both roles at once. 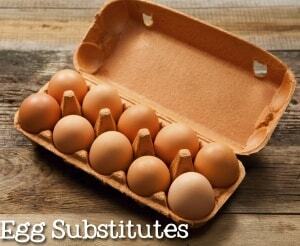 Determining which purpose the eggs play in the recipe will help you determine what to use as a substitute. Thank you so much for this, but I’m unable to print the chart. When I click on it, I get “Unable to find blog by that id”. This is one of the BEST charts & explanations I’ve found online! Thanks so much for sharing it, I have too. Is there a nut free list as well? It sounded like there would be, from your description, but I can’t see it? There isn’t – because in our baking we generally just leave the nuts out if there is a nut allergy. Food allergy occurs when the body reacts against harmless proteins in foods. A look at food allergies in pre-schoolers. How can I print out the Food allergy guide?